HVAC: TW Engineers sp. z o.o. LANDSCAPE DESIGN: Land Arch s.c. The building of the Małopolska Garden of Arts (MGA) has been realized according to a competition-winning design by Ingarden & Ewy Architects. The program and the initiative of establishing this new cultural institution in Kraków was proposed in the year 2004, by Krzysztof Orzechowski, Director of the Juliusz Słowacki Theatre and Janusz Sepioł, at the time the Marshal of the Małopolska Voivodeship. It is no coincidence that the building was raised in the vicinity of Karmelicka Street – a street popular with students and locals alike – opposite the building of the public library, with the aim of ensuring its smooth inclusion into the “bloodstream” of the city. The Małopolska Garden of Arts is a cross between two institutions: the Juliusz Słowacki Theatre and the Małopolska Voivodeship Library. The wing on Szujskiego Street holds a modern art and media library, with multimedia books and music, while the section standing on Rajska Street has been developed by the theatre, and is equipped with a multifunctional events hall. The new hall – operating, as a studio theatre, conference room, concert hall, and venue for banquets and exhibitions – holds retractable stages for 300 people. State-of-the-art stage technology is present overhead: fixed on hoists and cranes to the steel ceiling girders. This allows dramas and concerts to be performed, and exhibitions, film screenings, symposiums, conferences, art auctions, fashion shows, and many more events to be held. Altogether, the space of about 4300 sq.m houses a theatre together with a cosy cinema with 98 seats, a café, and premises for the organisation of educational, art-related activities. Krzysztof Bień, architect, a member of the Professor Janusz Bogdanowski Prize: “Tactfulness and a feeling of the space, use of suitable construction materials, and respect for the surrounding architecture: all these have contributed to the ordering of the formerly bedraggled Rajska and Szujskiego streets, and enriched the legacy urban tissue. 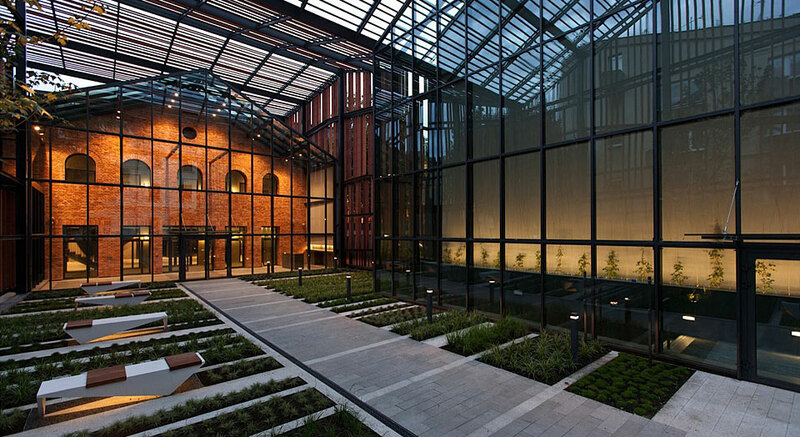 I express the hope, if not certainty, that this place will become another icon of Kraków.” – Laudatory speech on the occasion of the award of the 2012 Professor Janusz Bogdanowski Prize to Małopolska Garden of Art.